Imagine a country where astrologers often change the calendar, adding or subtracting days or months (no Mondays! ); governed by a policy of Gross National Happiness, where archery’s the national sport, traffic lights don’t exist, stamps are sometimes made of steel or silk, large, detailed, painted phalluses adorn many houses, and there’s no word for goodbye. The Land of Cockaigne? Hobbitville? Swift’s flying island in “Gulliver’s Travels” where Luputans try to extract sunbeams from cucumbers? No, an actual member of the U. N. : Bhutan, the world’s only Buddhist kingdom, half the size of Indiana, squeezed between India and Tibet, and the subject of three recent travel narratives that reveal more about this fascinating place. Kevin Grange’s Beneath Blossom Rain: Discovering Bhutan on the Toughest Trek in the World tells you the most, not only about high-altitude hiking, but the country itself. Is the Snowman Trek really the world’s most difficult? Consider: 24 days, 216 miles, seven of the eleven passes over 16,000 ft., one day’s ascent more than 2,375 ft. (more than twice the suggested rate), temperatures suggesting cryogenesis before lunch. I’d vote aye. Except for the usual corny campfire dialogue in trekking accounts, and coy, soap-operatic episodes involving a winsome German trekker, Grange describes it beautifully. Encounters along the way prompt him to teach us about this remarkable place: its flora and fauna , life in some of the world’s highest and remote villages , where a bicycle would be futuristic, national parks (Bhutan protects 34% of its territory), traditional skills, marriage customs, etc. For an immersion in many things Bhutanese, this is the book for you, part of the University of Nebraska Press’s excellent Outdoor Lives Series. 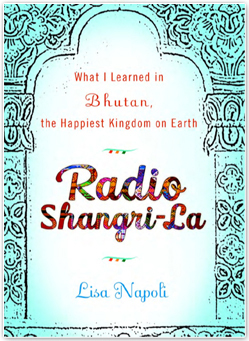 To learn of Bhutan’s urban life , I recommend Lisa Napoli’s Radio Shangri-la: What I learned in Bhutan, the Happiest Kingdom on Earth. 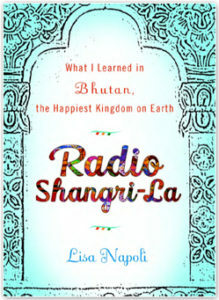 Napoli, a veteran NPR reporter, was invited in 2006 to The Land of the Thunder Dragon to help jump-start Kuzoo-FM in the capital, Thimphu (pop., 70,000), a new radio station, part of the fourth king’s expansion of the country’s media which included two new newspapers. King Jigme Singye Wangchuck funded the station by auctioning off the gift of a new BMW. Napoli taught the new disc jockeys radio etiquette ( microphone on?, encourage listeners to call in or volunteer—“it’s THEIR station”) and, along the way, saw the capital’s changes: the first coffeeshops and fast-food joints (“Tsab Tsab”, fast fast in drongkha), the coming of a constitutional democratic monarchy, cable TV (thus the use of outdated satellite dishes to dry chili peppers), and more. Kevin Grange trekked in the early fall to avoid the monsoon season. 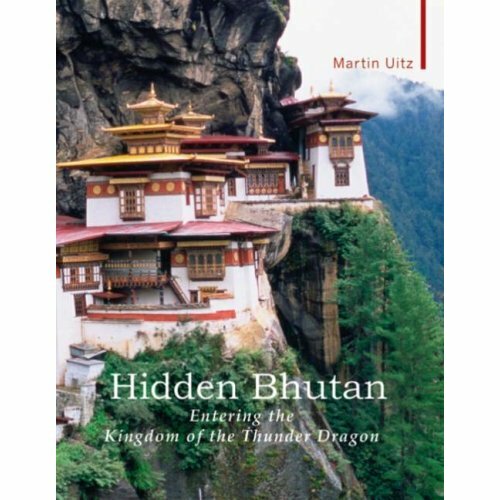 Martin Uitz chose to Snowman Trek during the summer monsoon & write briefly about his adventure in Hidden Bhutan: Entering the Kingdom of the Thunder Dragon. 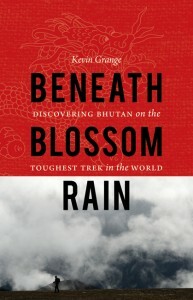 It’s also a fine overview of Bhutan. And those house phalluses? “We believe it is wrong to envy what someone else has,” Ngawang, a friend of Lisa Napoli explained. “When you have a phallus painted on the house, people will be too ashamed to look and to covet what they don’t have.” One of the many reasons Bhutan indeed is one of the happiest places in the world. Om mani padme hum.